We’re thrilled to be re-opening the doors to our Christmas Cop Shop in The Galleries today. (Tuesday 27 November). The Cop Shop is located on the ground floor and we hope to see as many people as possible in the run up to Christmas, to offer tips on keeping safe this winter, as well as having some festive fun. This year the theme is ‘Counterfeit Christmas’ and we’ll be partnering with Trading Standards to warn the public about the dangers of buying counterfeit items – however much a bargain they are. As well as finding out more about how to spot counterfeit items there will also be an opportunity for shoppers to try their hand at being a detective, spot the clues and track down the criminal selling counterfeit goods at our Christmas crime scene. Younger shoppers may enjoy exploring the police car outside the shop and trying on some uniform. We are also pleased to be supporting the Wallace and Gromit Grand Appeal again this year. Shoppers who would like to spread a little cheer to children spending Christmas in hospital can come and chose a gift from the wish list, and then bring their gift back to the shop. We will deliver the presents to Bristol’s Children’s Hospital the week before Christmas. PCSO Brenden Laben who is based at The Bridewell said: “It’s such a great opportunity to be here again in the heart of Bristol’s shopping centre in the run up to Christmas, so our thanks to The Galleries for having us back for the eighth year. The issue of counterfeit goods is an important one, as well as being illegal to sell them, they can also be dangerous. 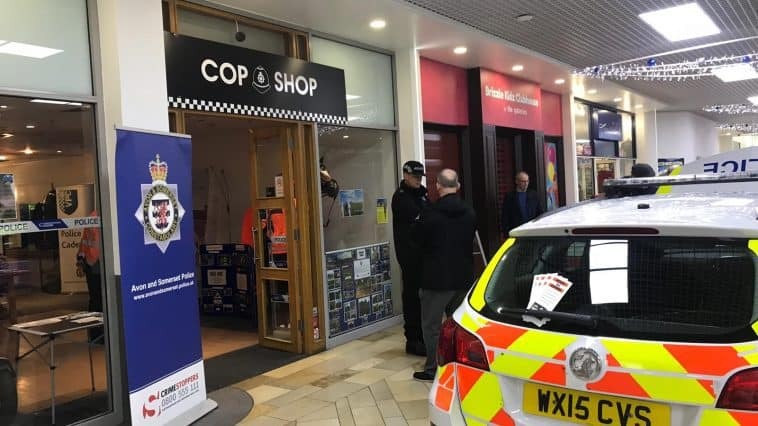 Avon and Somerset Police and Crime Commissioner Sue Mountstevens said: “I’m delighted that the Cop Shop will be returning to Bristol city centre this year. It’s a great initiative to help ensure local people stay safe over the festive period. The shop will be open seven days a week from 09.00 – 18.00 from 27th November – 23rd December.